"Absolutley gorgeous five gaited Saddlebred head." This Saddlebred head will truely keep people talking about the beauty this head offers. A great piece for an Omega necklace. With the wild mane being exaggerated it makes this piece fun for adding diamonds and gives it a look that will not go unnoticed. 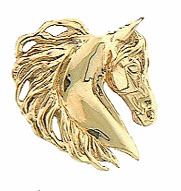 Be bold and daring try this piece in a satin finish or two tone with diamonds pave in the mane.